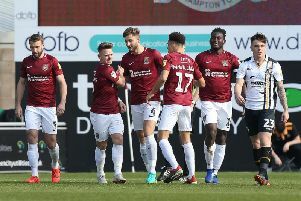 Bradford City winger Kyel Reid is in no doubt that he and his team-mates will be Wembley winners when they take on the Cobblers next Saturday. Reid has been a key man for the Bantams this season, but was an unused substitute when they were hammered 5-0 by Swansea City in the final of the Capital One Cup at the national stadium in February. He is hoping he will be involved on the big stage in next weekend’s npower League Two play-off final, and is certain that the west Yorkshire club’s season is going to end in glory. Reid told the Bradford Telegraph & Argus: “It’s been a fairy-tale season and there has got to be a happy ending. That will close the book. “We’re going back to Wembley and this time will be very different. “I’ve got a good feeling about how things have gone for us this season. Despite missing out on a League Cup final appearance, Reid enjoyed his day out in north London, and he intend to makes the most of things this time around too. “It was an amazing feeling to be among it,” said Reid, who was a real handful for the Cobblers defence when Bradford were 1-0 winners at Valley Parade in April. “Obviously I missed out on the last occasion we got to Wembley. “The spirit the boys showed to go out there and get back in the tie (in the play-off semi-final v Burton) was amazing. “We’ve played 63 games this season and the boys are still digging in and going right to the end. The Bantams are clearly in confident mood, with striker Nahki Wells already declaring that he will score twice against the Cobblers, but managere Phil Parkinson is at least sounding a note of caution. Bradford maye have turned on the style to win 3-1 at Burton last Sunday and claim a 5-4 aggregate win, but they were at one point 3-1 down i nthe first leg at Valley Parade, and Parkinson said: “It took us 45 minutes to get into the play-offs and we can’t afford that to happen. I’m sure it won’t. “The first half last Thursday was another lesson for us that if you’re not really on your game, you’ll get punished. “That’s what happened in the first leg but we rectified it and turned it round.